You were following my blog, living my excellent adventure vicariously, and decided to take the plunge yourself. Now you've got a nice shiny scooter that performs flawlessly and jumps to life with the slightest press of the starter and twist of the throttle. But wait... you do know that it's just a machine, with an internal combustion engine, right? Under that pretty skin there are wires, relays, cables, a computer, locking mechanisms, a carburetor or fuel injectors, a piston, drive shaft, fuel line, drive belt, air intake, exhaust, light bulbs, fuel evaporation canister, catalytic converter, drum and disk brakes, springs, shock absorbers, fuel tank, fuses, a swing arm, rollers, oil filter, and other odds and ends that generally lurk within. All that stuff, along with all other man-made things, is quietly struggling to get back into the ground from which it all came. Mother Nature is very patient, so she works very slowly. Fortunately, we can put off her plans for our bike, more or less indefinitely as far as we're concerned, all with a little maintenance. When Mother Nature occasionally gets the upper hand and something stops working, we can step right in and repair whatever broke, and be back on the road, sailing along in no time. Of course, over the long haul, unless our scooter ends up in the hands of a maintenance and repair wizard, as is the case notably for the Ford Model Ts you see every now and then, most scooters, no matter how loved, will end up in the wrong end of a scrap yard, or worse. Now I'm no mechanic. But I do add fuel, I don't mind messing with my Vespa's nervous system (check out my gear posts, above), I'll readily monitor and top up tire pressure, and I am toying with the idea of doing an oil change, but that's about it. I don't have to worry about tune-ups, changing tires, changing spark plugs and filters, because I have ready and easy access to a phenomenal crew of motorcycle and scooter mechanics over at Alex Berthiaume et Fils. And when I say "phenomenal", I'm not kidding, they are that good. They should know what they're doing, they've been selling and servicing motorcycles longer than anyone else in these parts. All the way back to 1917 in fact. They are also Canada's most successful Vespa dealer. So there! That's where my baby gets new shoes and all the other stuff needed to keep both of us sailing happily down the road. Wait! What if you and your Vespa are hundreds of miles from a good mechanic? Clearly you need to help yourself. You may have to tackle much of that routine maintenance on your own. Or maybe you're destined to become a talented "wrencher" yourself. I've got you covered there too! 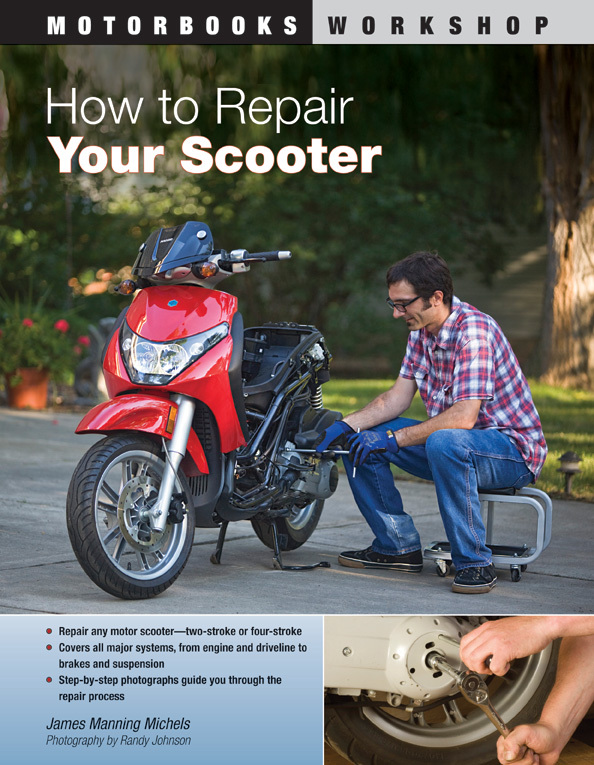 Go on over to Amazon and pick up a copy of How to Repair your Scooter. For about $20 you can have an expert mechanic guiding you along, making sure that when the job is done, you'll have done it right! The book is very well organized, designed for the do-it-yourself-er, with lots of nice clear crisp color photos so that you know where you're going before you get there. If I do attempt an oil change, and now I'm even more sure that I may actually do it, that book will be cracked open and resting on the saddle for the whole procedure. Wish me luck... naw don't bother, I've got the book! In the interest of full, plain and clear disclosure, I hastily add that while I receive absolutely nothing, nada, zip, for plugging my Vespa dealer, the publisher did send me a no-strings-attached advance copy of the book as encouragement for me to blog about it. I could have read it, kept it, and then said it sucked. But it doesn't. It is really very good. It therefore gets my unqualified endorsement. Oh no, David. Not going there. Thanks. I rather spend my time riding. Hmmmm wonder if we'll see you doing that oil change nex time? 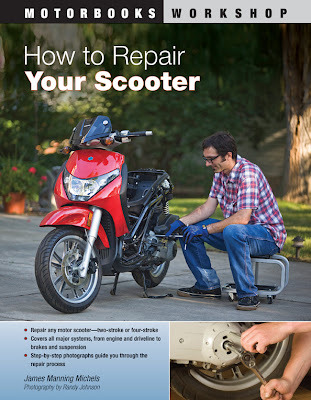 Good to know there is help out there for the do-it-yourself scooter mechanic. Sonja, Trobairitz, time will tell whether I'll tackle that oil change. I'm afraid that there are routine home maintenance tasks on my must do list that aren't getting my attention these days, so I wouldn't hold my breath waiting for that post on an oil change.